Departments of Earth Science, Geology, and Paleontology can use any or all of our many services and facilities as a temporary field station. (The Paleon is actively soliciting permanent status as Field Station of an institute of higher education). The Paleon has, over the last 16 years, developed many dig sites. Some are within walking distance of the museum, some require a half day’s drive. All are within Wyoming. Most of our sites are on private land with the express permission of the land owners. Some are on state property (marine invertebrates) and some on city property. For a more in-depth description of the various sites, see our Dig Strata. 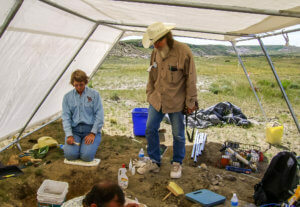 Several of our sites have the proviso attached to our contract that the fossils recovered are not to be sold or permanently leave the state of Wyoming. This does not preclude long term loans or leases of the fossils, or the selling or loan of casts of the fossils. Our Morrison finds come from the well known Como Bluffs, of Marsh and Cope fame (we even have a signed copy of one of Marsh’s field reference books). Arrangements can be made by picking up the lease or sub-leasing from any current holder.